gardening with friends : Kindly sent to me by Dr Bob and his wife. You can return to our gardening with friends page or browse the pictures using the next and previous links. Kindly sent to me by Dr Bob and his wife. They have a wonderful scent. Beautiful, TT and what a lovely gift. How wonderful Terra and what a very thoughtful and kind response! Beautifull TT and really kind and thoughtfull of Dr Bob and his wife.. Arent gardeners Wonderfull People ..
Beautiful TT. A great gift from two very thoughtful people. These lovely flowers arrived in tip-top condition with good instructions on how to care for them. What a lovely surprise for you, TT. They are beautiful. It was Dr Bob's wife's idea to send them. These are my Mum's favourite flower. How kind of Bob, must have brought a tear to your eye. Flowers mean so much and show that others care and are thinking about you when you received them. 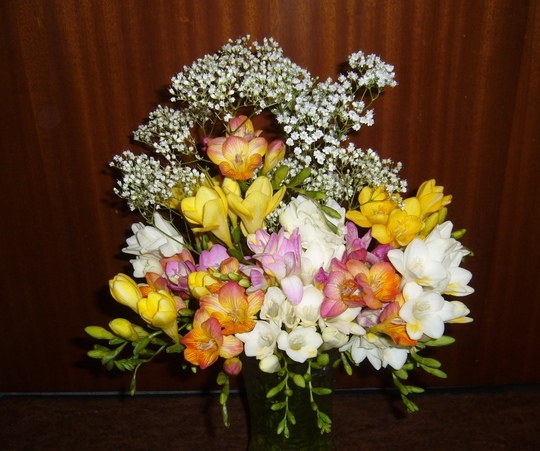 Beautiful flowers, I love freesia. How beautiful. I can smell them from here. What a lovely thought. Wow, Gilli, you've a very talented nose, smelling those freesias all the way from BC. Lol. Lovely. Can almost smell the Freesias.... Julie's favourites! These are so pretty aren't they.. Yes, cheered you up a little I would imagine, receiving these. I love freesias, so lovely & perfect. I did not get your "private message TT?? don't know why?? Are U OK? They are so pretty, that from here they looke FAKE! (Now isn't that funny, that fake flowers look "So real!" and real flowers "Look Fake!" That cracks me up!) Hope they keep your spirits lifted! Sorry you didn't get my message. Now, Poetgardener, these freesias are definitely REAL. Lol. I love fresias. I hope they brought you some comfort TT. Yes, Hywel. The flowers are still doing really well.. I've just put them in fresh water. Thought it was because I was tired. Lol. I spoke with a florist friend of mine a while back about keeping fresh flowers going for a while, and he said that you should put a little sugar in the water if you run out of the white powder. And others swear by an aspirin in the water. And yes, keep changing the water. And snip the bottoms when they get soggy. They should stay nice a good long time. Hang in there...I'm sure the fairy's are watching over you! Conker says thanks for the scratch from Odie and Popie. ThanksTT, I guess i did not know to check my Inbox, now i know. I am sure Conker will respond to the awesome love that is going his way You know so well what a wonderful sense these animals have. We will send all our warmest love to Conker & hope 4 his recovery. Just love him to bits, he will feel all that love to make him better again. Sad to hear. I'm glad you found my message. I've told Conker all the love and good wishes you've sent. He's certainly getting lots of affection and attention here. glad the vet thing is going well. i have also used lemonade in vases too. i saw a fairy face too. lovely thought sending you flowers. they are really pretty. This is lovely. The climbers I have on my arches consists of Akebia Quinata, which is almost evergreen and vigorous, clematis Cirrhosa Freckles which is evergreen and vigorous. It has totally covered a long trellis from top to bottom about 6 feet high. Jasminum Polyanthum tender evergreen and Solanum Crispum Glasnevin. I have not got the last two, but you could maybe look them up in Google. Beautiful flowers! I keep wondering how you and Conker are doing, glad to hear there has been some improvement. These flowers are lovely, aren't they ! I've put some updates about Conker on my current blog, and I'll have more news next week after Conker's blood tests. Thank you so much for the photo TT. what a surprise it was for us to see the freesias. They are our favourite too. Guernsey flowers always do a wonderful job. Highly recommend them. So glad they cheered you a little. We are glad to hear Conker's chemo went well and he is feeling a little better, we have been thinking of him while we were away. Conker is doing well so far.. He will take higher dose of chemo tablets this coming week, so fingers crossed. Lovely freesias....i didnt click mine this season...btw do you remove them during winters or just leave them in the garden..
Like all bulbs, corms, tubers they have a dormant period. I'm afraid I can't comment in your part of the world.